Remember my battle cry: Use WhatCha Got! You see, the Parmesan lid fits a standard canning jar opening, whether 1/2 pint, pint or quart. I’ve wanted to get my hands on one of those lids for awhile. But again, RancherMan hates dried Parmesan cheese so I’ve never bought any. Now that I’ve gotten this empty jar from my sis I’ll get started repurposing it. This is perfect to use when I’m baking! The small jar takes up very little space in my spice cabinet. And one side of the lid opens wide, making for easy measurement when I’m cooking. Plus the top of the lid levels off the contents in my tablespoon. 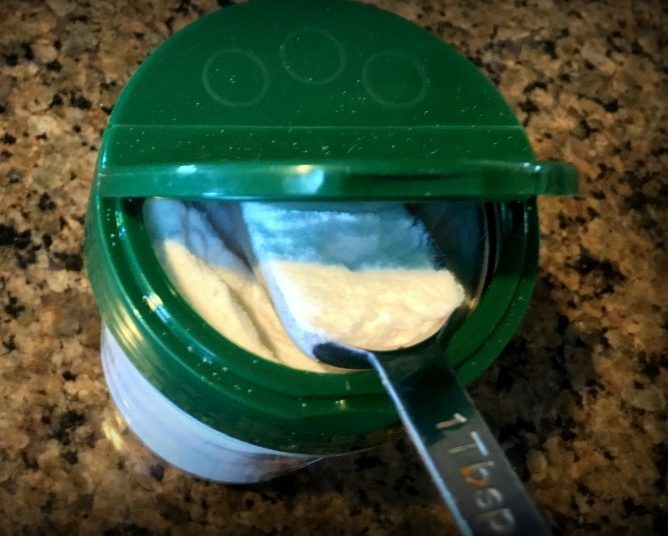 The excess simply falls back into the jar. No mess! The other side of the flip-top lid has sprinkle holes. I’ll use this side when I’m scrubbing my pots & pans. I typically use baking soda for an environmentally-friendly option when a little extra cleaning uuuumph is needed. It’s cheap, it’s effective and it’s non toxic. Since starting this simple-life journey I’ve begun looking at many things with a different eye. My sis looked a little sideways at me when I explained to her what I was gonna do with the lid. My guess is she won’t offer me her next Parmesan cheese jar. I think she might have the perfect idea about how to reuse it! This entry was posted in Blog Posts and tagged Cooking, Environment, Frugality on December 4, 2016 by Texas Homesteader. 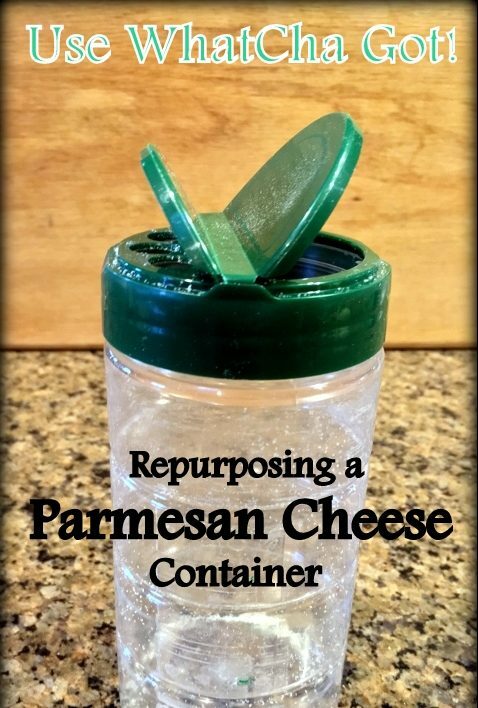 great idea for a small sized parm container. we buy the huge ones from sam’s club. i haven’t repurposed any yet, but was thinking they might be great for holding spaghetti or angel hair. hummmm. thanks for getting me thinking! I keep all sorts of empty containers and I may just have one of those. I hadn’t thought to use it that way, but it makes perfect sense! I keep empty herb containers to put my own in, too. I use mine for homemade bathroom cleaner. 🙂 Stopping by from This is How We Roll Thursday hop. I have been using those lids and jars for some time now. They work great with cinnamon and sugar to do toast and your cinnamon apple slices also an extra lid for leftovers on jars. I buy sodioum bicarbonate by the 50 pound bag at the feed store to use in laundry and my household mixes , it keeps in a bucket just fine. Love your website. Happy Holidays! I did the same thing! I buy a big bag of baking soda from Costco and then fill my jar as I need to. Had to get used to screwing on the lid backwards though. I don’t know if thats true with all these lids or just the one I used. It’s very handy though!